Remember last year, when I wrote a novel-length collection of short Christmas genre fiction and posted it daily to the blog in December? Well, I enjoyed it so much, I decided I'd rather rip my teeth out with pliers than try to do it again this year. So if you were hoping to get another twenty-five short stories out of me this December, you're out of luck. I might - MIGHT - write a handful if I get any ideas worth pursuing, but don't expect anywhere near the level of fiction I wrote in 2012. I burned through just about every idea I had, and I don't have the kind of free time this year I had last. To make it up to all of you, I'm giving away the new e-book version of last year's* collection for a limited time on Smashwords. Now you can take the stories of Mainlining Christmas with you wherever you go. I mean, you could probably do that before, assuming you have a smart phone. The stories are still sitting here on the site, after all. But then you'd miss out on the NEW COVER. 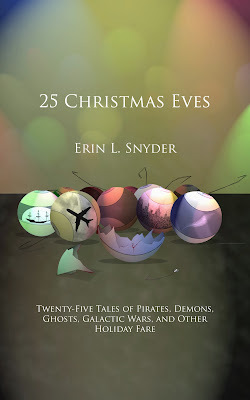 So, the upshot is you can now download your own copy of 25 Christmas Eves to your Kindle, Nook, computer... whatever. And, for the time being, it's completely and totally free. What are you waiting for? Get it now! Tell your friends to get it now! Tell your enemies not to bother (because this book is awesome, and screw those guys). *The collection actually contains stories written over the past two years. But only three are from 2011, so that's really just a technicality. You know what? Just... go download the damn book. You know those nights where you really need to go to bed because you've got a workshop tomorrow morning and at some point you need to do laundry but then you find a really entertaining blog and you're just tired enough to not stop reading? Yeah.... You guys are awesome though, and as I am a total Christmas geek (This year more than most - it's weird) I am very much enjoying your blog! Here at Mainlining Christmas, we pride ourselves on decreasing the cleanliness of the world's laundry and on making our readers tired, groggy, and irritable the next day. Seriously, though - thanks for the kind words!